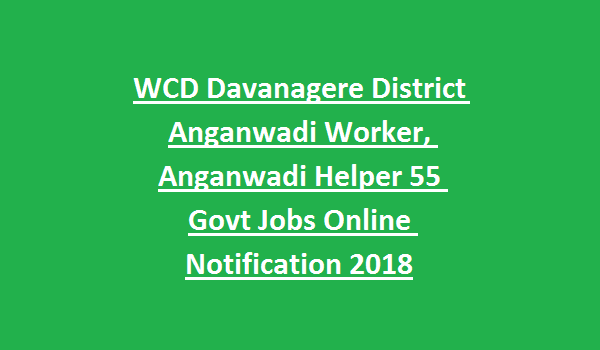 Davanagere District WCD Anganwadi jobs Recruitment 2018. Mode of application is online for this Davanagere Anganwadi Helper/Worker jobs from 06-12-2018 to 06-01-2019. Apply online through the WCD official website of http://anganwadirecruit.kar.nic.in/. Candidates who are qualified 4th class they can apply for Helper jobs and those who qualified 10th class or SSLC they can apply online for Anganwadi worker jobs. You have to apply for your village only. Candidates selection is based on interview for this Davanagere District Anganwadi Helper, Anganwadi worker jobs. Detailed information about this Davanagere Anganwadi jobs are given below. 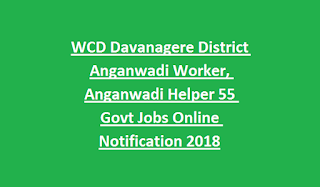 There are total 55 jobs in this WCD Anganwadi Davanagere District recruitment. Candidates must have qualified 4th class for applying these Anganwadi Helper vacancies of Davanagere district. For Anganwadi Worker jobs SSLC qualification is required. Age limits for these Anganwadi jobs is 18-35 years. Age relaxation are applicable as per the norms. Only native village or ward or municipality candidates are eligible to apply. All the documents will be verified at the time of interview. Female candidates who are looking for these kind of vacancies they can for this Davanagere District Anganwadi Helper/Worker jobs from 06-12-2018 to 06-01-2019 through official website of http://anganwadirecruit.kar.nic.in/.